The times where cellphones were shrinking every year are apparently over. Now the motto is "think big", at least when it's up to the manufacturers. They are increasing the size of their smartphones with every new generation. The artificial term "phablet" will likely prevail as the category name. However, "smartlet" is also read occasionally in German-speaking countries. The pioneer of large phones was Samsung's Galaxy Note that has a diagonal of over 5-inches. The latest top-models from Sony and HTC as well as the eagerly awaited Samsung Galaxy S4 are either just below this 5-inch size or even surpass it. Compared with our current Asus Fonepad test device, they almost look puny. The Fonepad features a screen size of 7-inches. We categorize it as a tablet with phone functionality due to just this fact and its name. A headset is not required. Asus fills a gap that perhaps doesn't even exist with the Fonepad, and it is something special with its Intel CPU beyond that. Until now only two smartphones based on Intel's Atom exist, namely Motorola's RAZR i and ZTE's Grand X IN. 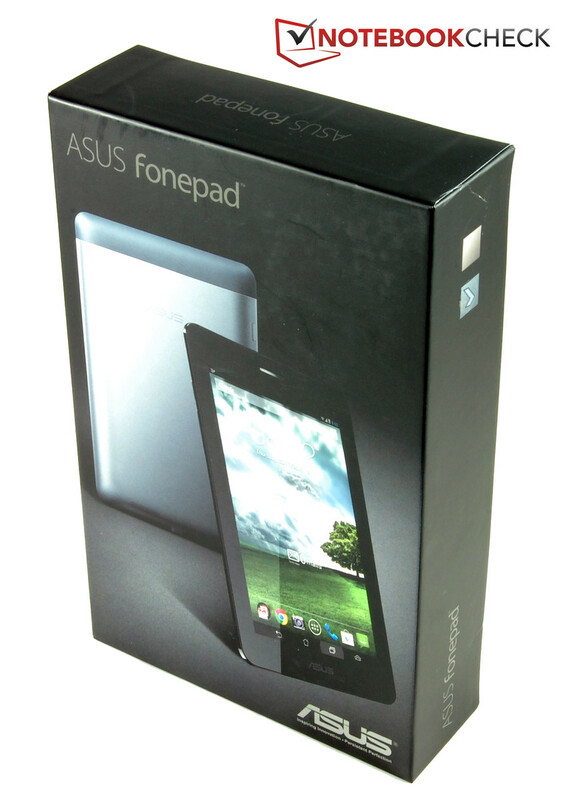 The Fonepad is thus the first Atom powered Android tablet. Further key specs are a 1 GB working memory and 16 GB of expandable internal storage, Android 4.1, a 1280x800 pixel IPS screen and a 3G module with HSPA+. All this is available in the colors Champagne Gold and our test device's Titanium Gray. The price is 229 Euros (~$300). The Fonepad does not exhibit any special features on the front. It looks and feels like a plain 7-inch tablet. A plastic pane protects the touchscreen. It could defy light scratching attempts with a key. However, the surface will unlikely be as resistant as the frequently used Corning Gorilla Glass. The back is also completely made of plastic. The aluminum looks make a high-quality impression. We do not have any complaints on build either. Even the removable cover in the upper eighth part of the casing merges almost seamlessly into the rest of the casing. The sliding mechanism for opening it worked flawlessly. The micro-SIM and micro-SD slot are found beneath the small cover. The casing's rigidness is also satisfactory. The 7-inch tablet weighs 340 grams. Thus, Asus' Fonepad does not count as the lightest device from this size category. Apple's 7.9-inch iPad Mini, for example, is approximately 10% lighter. The Fonepad features beveled sides and conveys a slimmer impression than it actually is. It has a height of 10.4 millimeters. 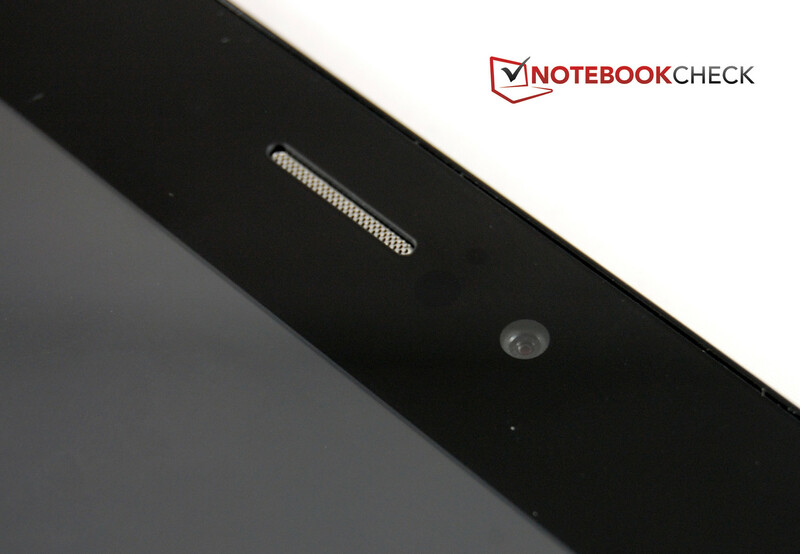 Consequently, it is almost on a par with Google's Nexus 7 in terms of size and weight. 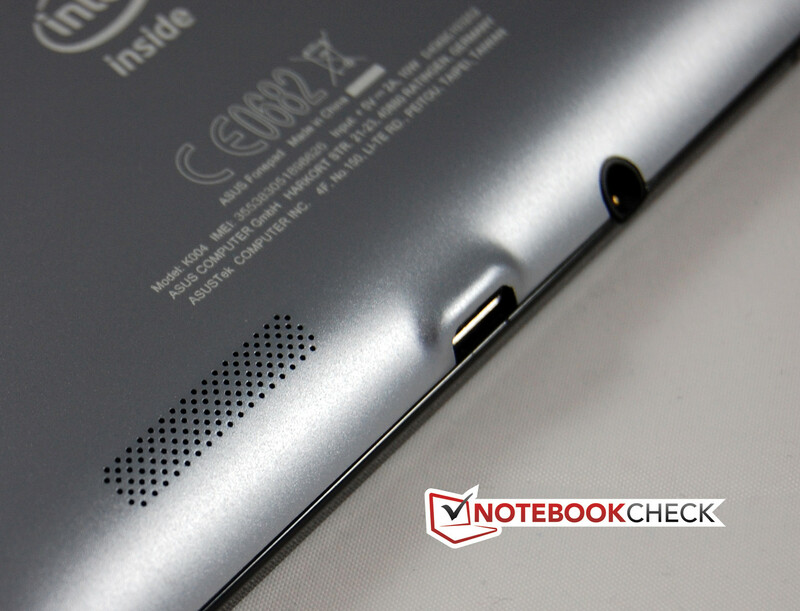 The familiar, but still very rare in the tablet sector, "Intel Inside" logo adorns the back of Asus' Fonepad. 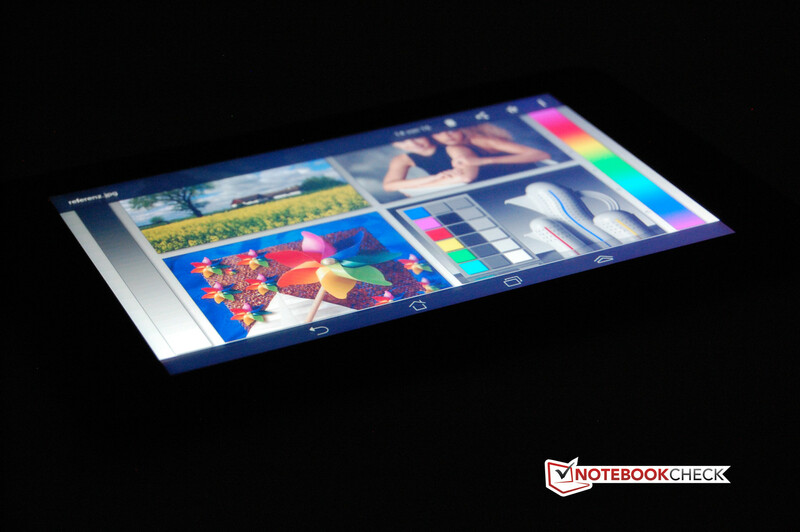 Intel's Atom Z2420 single-core processor is the phone-tablet's heart piece. It can process two threads simultaneously via Hyper Threading. The clock rate is 1.2 GHz. In addition to the Intel CPU, the GPU model PowerVR SX540 also finds room on the SoC (system-on-a-chip). It can be classified as a good midrange model and matches the Fonepad's claim and price. The working memory capacity is a decent 1 GB. More can hardly be expected in this price range. This also applies to the tightly measured, 16 GB internal storage that can be quickly expanded for a reasonable price via a micro-SD card. The device supports cards with up to 32 GB. The number of interfaces is very limited, as typical for tablets. A combined USB / charging port and a 3.5 mm headphone jack are on the bottom when held in portrait mode. The slots for the SIM and memory card underneath a cover and the built-in microphone are on the opposite side. Both the power button and volume rocker are on the left and clearly show that Asus intended the Fonepad to be used in portrait mode. 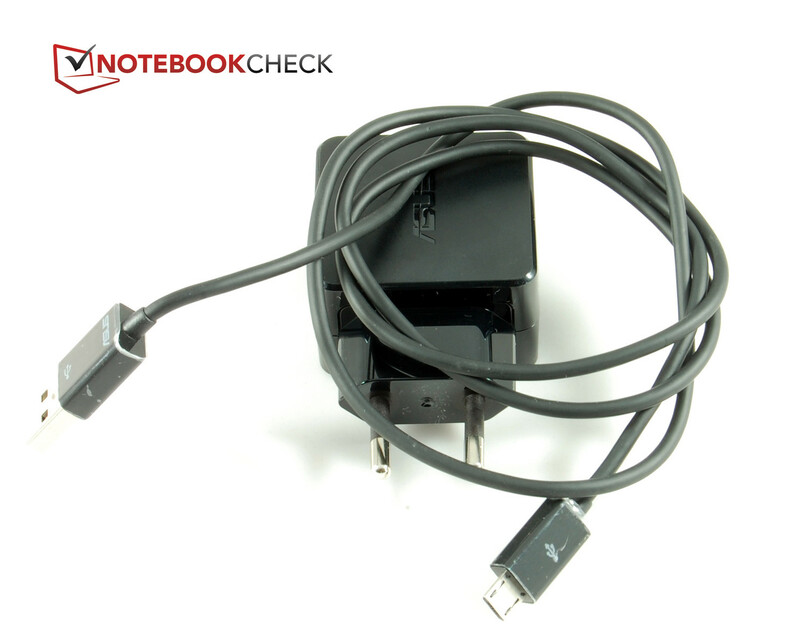 Asus includes a USB cable and a small PSU that supplies the USB port with power. Besides that, there are only some printed documents. The manufacturer gives a 24 month warranty on its device. 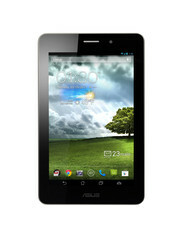 Asus' Fonepad uses the Android 4.1.2 operating system. The Taiwanese manufacturer relies on Google's older version of Jelly Bean that has now been replaced with version 4.2. At the time of this review, no information was available from the manufacturer about a possible update. 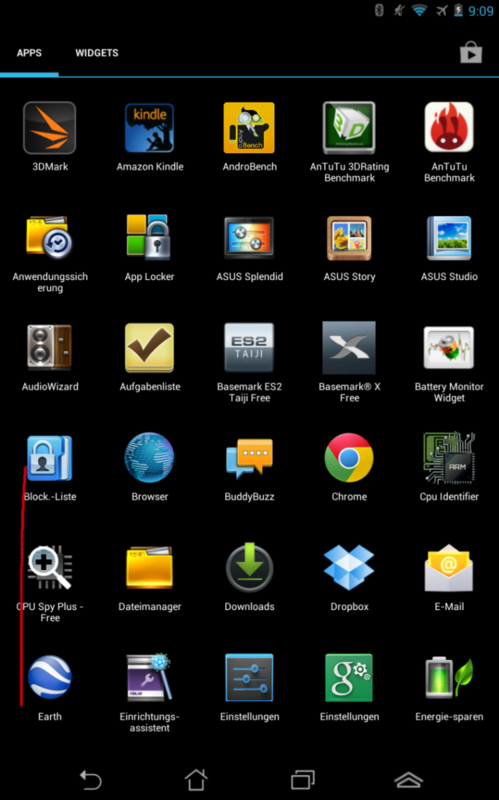 Asus did not modify the Android interface much. The Fonepad features an Asus-typical virtual keyboard. Its layout primarily looks different than standard keyboards. They work in a similar way with exception of the permanently faded in number row. 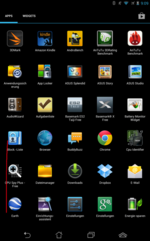 A few Asus apps are also installed and regrettably cannot be deleted. Additional settings called Asus User Settings and Energy Management can be found in the menu. Asus has also added an extra symbol to the Android icon row at the screen's bottom. The double-headed arrow opens a quick access bar with apps such as browsers or to-do lists. 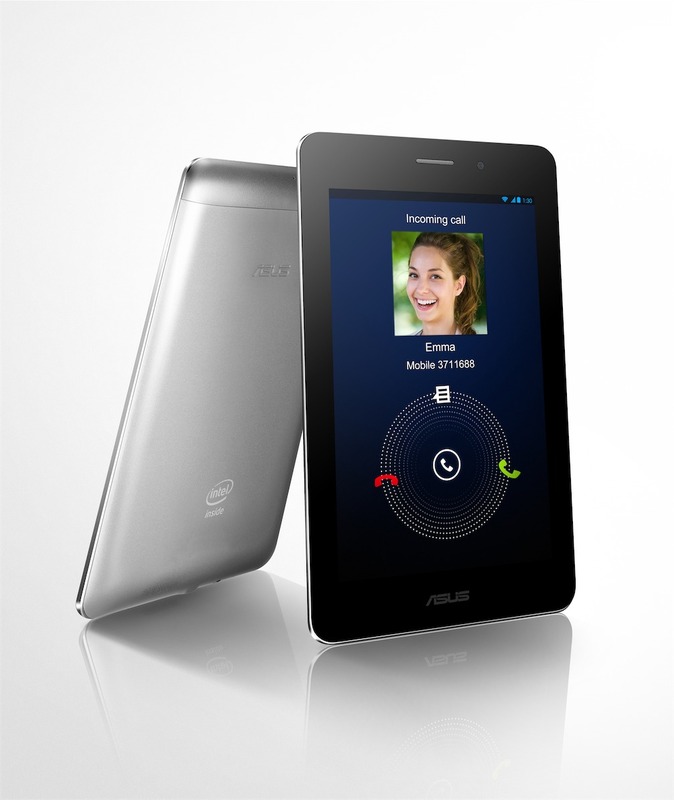 Asus' Fonepad connects to the internet either via b/g/n Wi-Fi or the integrated 3G module. The fast HSPA+ standard is supported and promises data rates of up to 21 Mbit/s in downstream and 5.76 Mbit/s in upstream. LTE is not available. In our opinion, this is not devastating particularly when considering the price. With the short-range transmission standard NFC, the Fonepad is absolutely state-of-art. 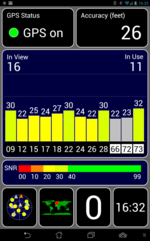 However, Bluetooth 3.0 is not quite as up-to-date. This standard is particularly at a disadvantage in energy management compared to the latest 4.0 version. The Fonepad also features a GLONASS-capable aGPS receiver. It worked absolutely flawlessly. An initial satellite connection was set up in less than 20 seconds even indoors. 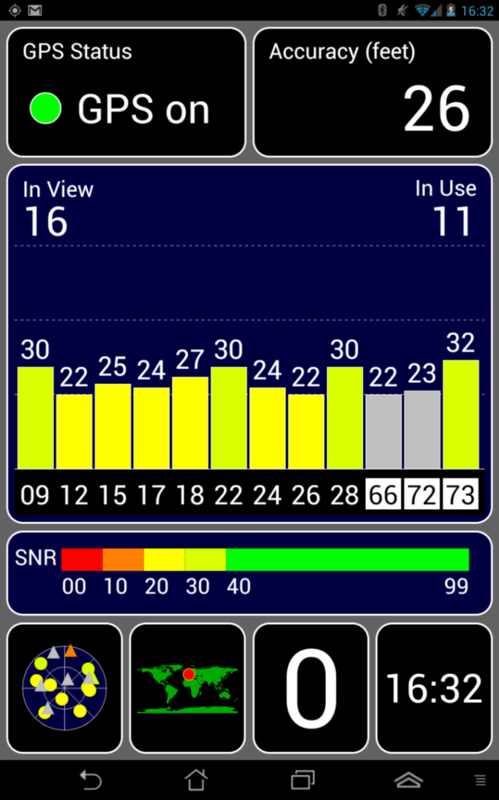 It was also stable and relatively accurate, at least according to the app GPS Test. This chapter is normally omitted in tablet reviews. However, since the Fonepad also can be used for calls we naturally wanted to take a quick look at the corresponding app. It is quite slim and, apart from the compulsory key field, call and contact lists it does not really have anything interesting to offer. However, this also prevents confusion and can be used intuitively right away. Apart from a few exceptions, 7-inch tablets only have one front-facing camera. We cannot say why seeing that small tablets are much handier than their 10-inch counterparts and thus more suitable for taking pictures and videos. Asus' Fonepad also only features one camera. It is a front-facing model that is located beside the speaker at the top. It only has a low resolution of 1.2 MP. However, the resolution should be enough for its conceived primary purpose, namely video chats. It is insufficient for shooting pictures as can be seen in our sample photo. It lacks focus, is very distorted and much too dark. Asus has done an almost perfect job with the touchscreen and control buttons on the Fonepad. The phone-tablet's use is very smooth; the touchscreen accepts gestures with up to 10 fingers. This will rarely ever be the case. It is important that commands are implemented accurately and quickly. The power button and volume rocker are well-palpable and feature a decent pressure point. However, they are not always easy to access because of the beveled sides. It is difficult to press the buttons when the Fonepad is held in one hand without the device slipping out of the hand. The Android symbols are permanently faded in at the screen's lower edge. This facilitates use but also takes up a bit of the screen's surface. Rotating screen content only takes a second. The screen in Asus' Fonepad has a diagonal of 7-inches, which is exactly the same size of many current tablets. However, in contrast to the Fonepad, they usually cannot be used to make calls. The resolution of 1280x800 pixels is on a par with Google's Nexus 7 and exceeds the 7.9-inch Apple iPad Mini that only displays 1024x768 pixels in a 4:3 aspect ratio. In contrast, Asus uses the 16:10 widescreen format. The pixel density is 215 ppi, which is enough for a sharp display of even fine details. The screen does not achieve top rates in the lab. Particularly the measured maximum brightness of 300 cd/m² could be higher. 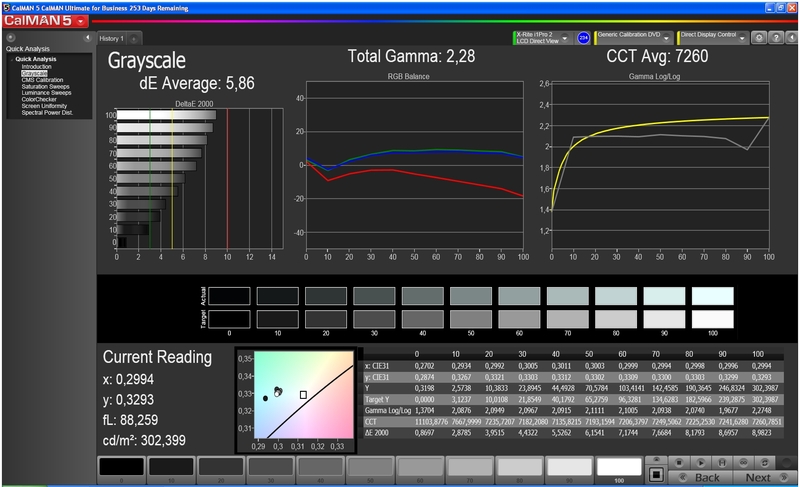 Nevertheless, a very high contrast of 1020:1 results due to the comparatively good black value of 0.3 cd/m². The illumination of 85% is only middling. The brightness particularly decreases in the lower right corner, which is also vaguely perceptible on a white screen. 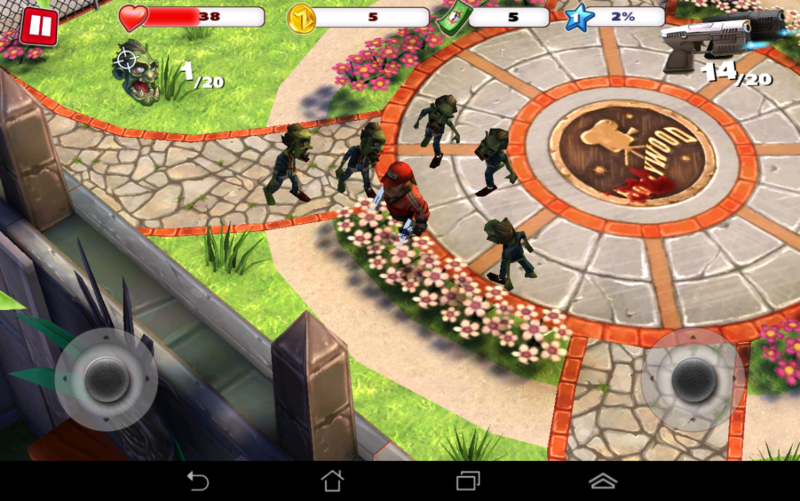 The subjective picture quality of Asus' Fonepad is appealing. Dark areas are saturated, colors look bright and natural. 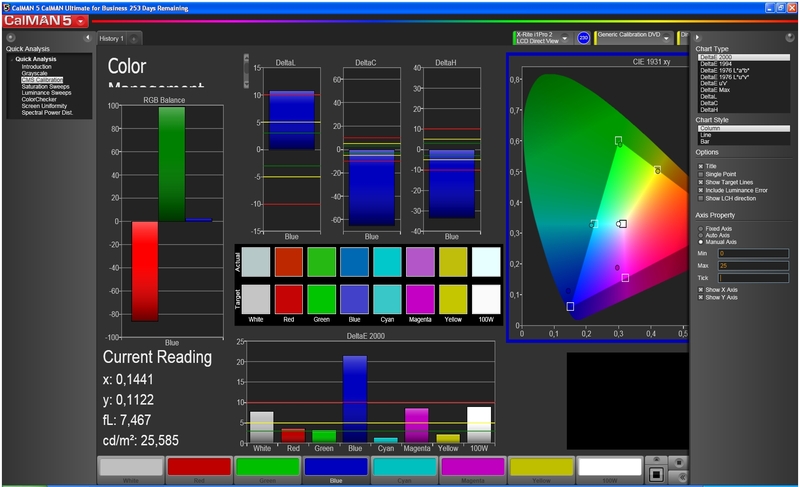 The X-Rite i1Pro 2 colorimeter did not quite confirm this impression in the test using CalMAN software. Light shades are particularly quite remote from the sRGB color gamut's reference in the grayscales. However, the colors are more accurate. 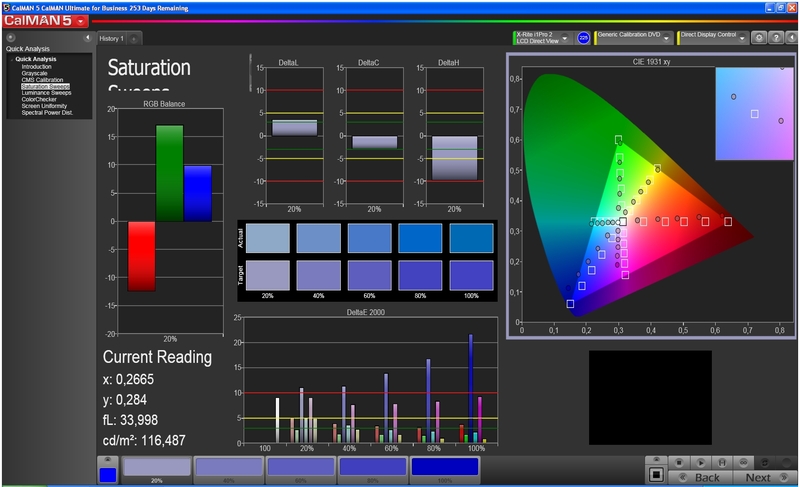 Only blue is clearly too dominant, especially in a higher saturation. 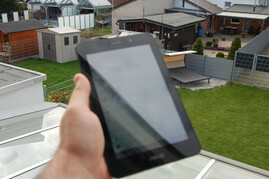 The Fonepad will very likely be used outdoors frequently as it is a tablet with phone functionality. However, that will not be possible in direct sunlight due to the screen's reflective surface and only middling brightness. A place in the shade would be advisable. The viewing angle stability will not be a reason for any failures because Asus' Fonepad achieved a very good result here. 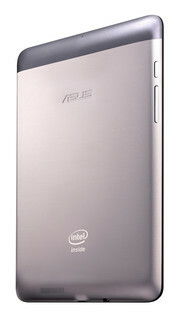 Asus' Fonepad sports a single-core CPU. This seems unusual for a modern tablet from a renowned manufacturers. However, this is deceptive at first glance, as is frequently the case. Although Intel's Atom Z2420 really only clocks with one core, it supports Hyper Threading technology known from Intel's desktop processors. This technology allows one core to process several threads at the same time. It is two threads in the case of Asus' Fonepad. The CPU has a rather slow clock rate of 1.2 GHz and it is supported by 1 GB of RAM. 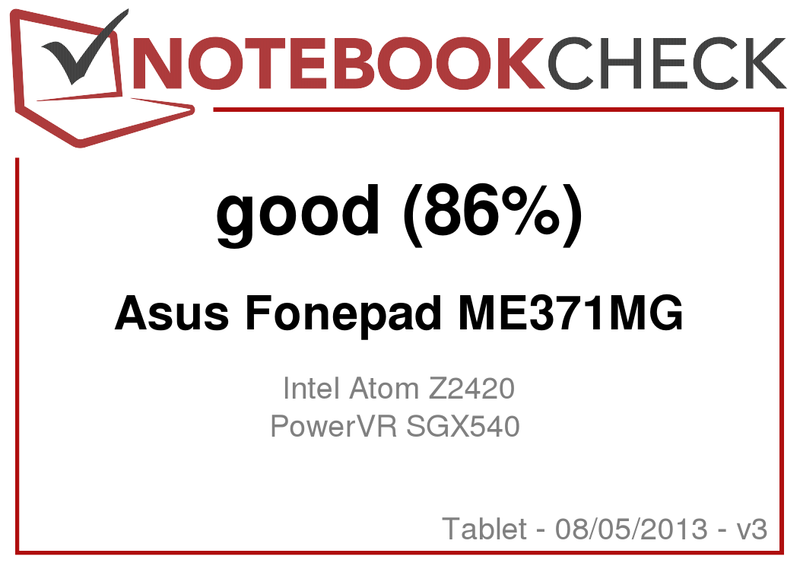 As in the smartphones based on Intel's Atom processor, not all benchmarks ran flawlessly on Asus' Fonepad. For example, GL Benchmark 2.7 did not start and the Peacekeeper test recurrently crashed with the message "unknown error". We cannot say for sure whether these problems are solely due to the Atom architecture. 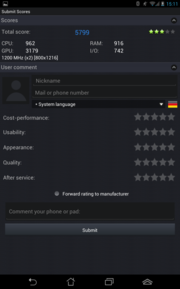 The conclusive benchmarks recorded a mixed performance for Asus' Fonepad. This was also the case for all previously tested Intel smartphones. The Fonepad cannot compete with Google's Nexus 7 or Samsung's Galaxy Note II and even Motorola's RAZR i could gain a lead. The graphics solution is the same one used in both Intel smartphones. However, their higher SoC clock leads to somewhat better scores in all graphics benchmarks. Overall, Asus' Fonepad is in the upper midfield in graphics performance anyway. The internet performance results were also quite good. The Fonepad placed itself before or on the same level as both Intel smartphones. Google's Nexus 7 was surpassed in most benchmarks. This is also in line with the subjective browsing speed that does not give reason for complaint. Last but not least, we looked at the NAND memory performance. We used the AndroBench 3 benchmark app for this. 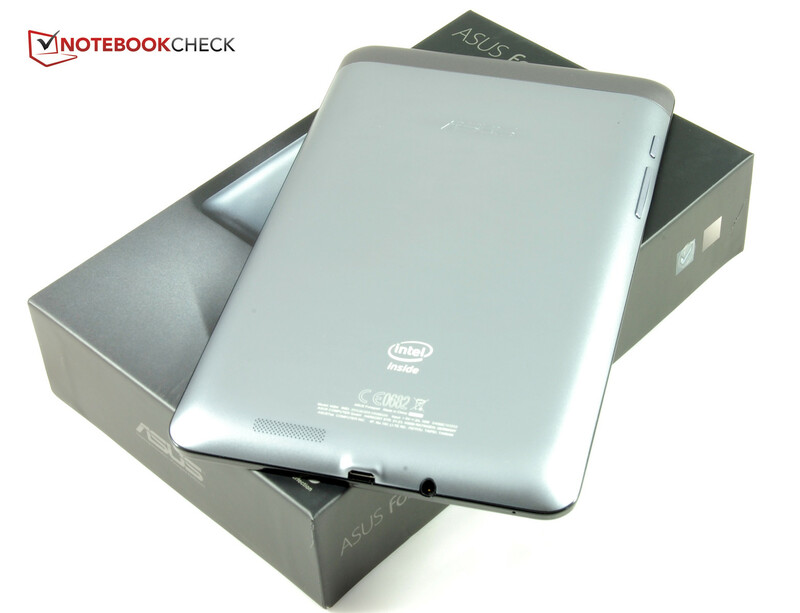 Asus' Fonepad displayed a solid performance but did not stand out in any particular test. It has the low 4K block write score in common with most contenders. 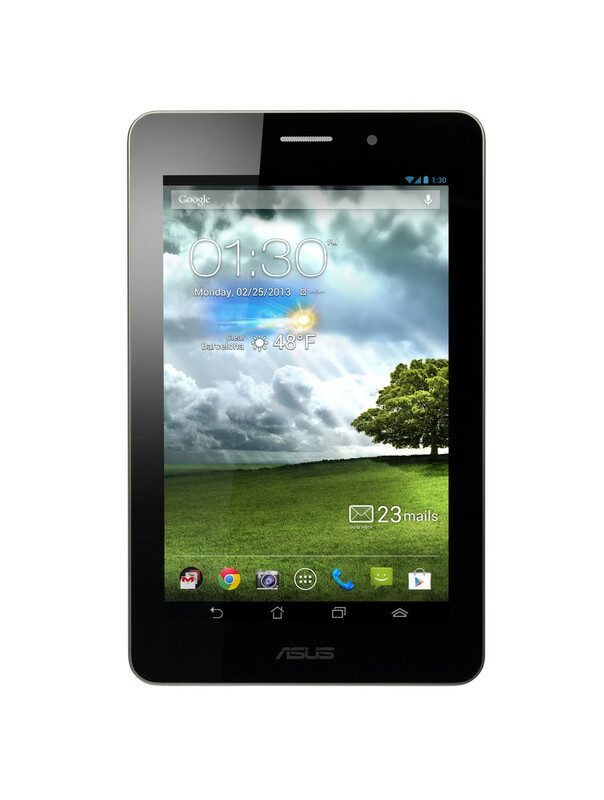 The benchmark scores clearly indicate that Asus' Fonepad is gaming suitable. More basic games, such as Angry Birds, were no challenge whatsoever. 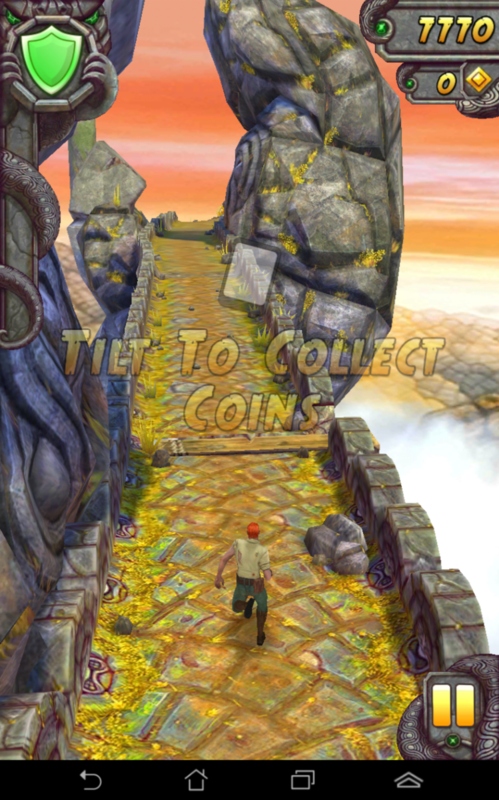 Temple Run 2 ran smoothly and completely without stuttering. However, the Fonepad had a few problems with some games. These problems are not related to lack of performance but more because Intel's platform still does not support a few games. For example, we could not run ShadowGun: Deadzone 2 to start with. The tracks that started, e.g. Zombiewood: Zombies in L.A.! could be played absolutely smoothly. Unfortunately, Intel's architecture wastes a part of its potential here. Users who actually put the big 7-inch Asus Fonepad to their ear, or more likely to their head for making calls, will be treated to quite good audio quality. Voices are loud and clear. Of course, the sound is not absolutely natural but that is rarely the case in mobile networks. The integrated speaker also does a good job as a hands-free system. Nevertheless, a headset should be included in a telephone-tablet's scope of accessories. Heat development is a major issue particularly in very cheap tablets. Even the power supply often gets very hot. Asus' Fonepad is certainly not a cheap device though and the manufacturer apparently has the waste heat issue perfectly under control. The ascertained surface temperatures do not allow any other conclusions. The surface never surpassed a temperature of 31.5 °C at any of the 18 measuring points in routine use where the processor is mostly idle. The maximum temperature only increased by 1 °C during full load, which is very good. However, the temperature of the obviously too small power supply did not appeal to us. The infrared thermometer recorded a maximum rate of over 60 °C. That is much too high and it also feels hot when held in the hand. (+) The average temperature for the upper side under maximal load is 30.5 °C / 87 F, compared to the average of 30.7 °C / 87 F for the devices in the class Tablet. The small speaker is located on the back's lower edge in the area of the USB / charging port. 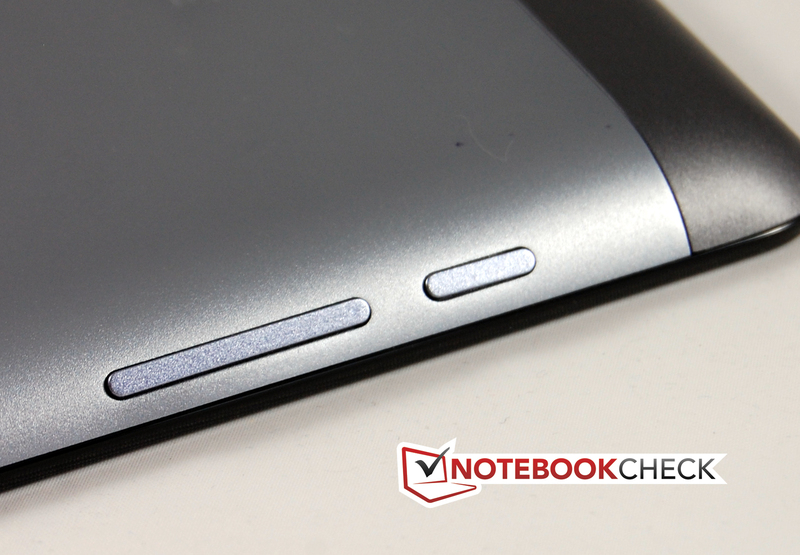 The Fonepad's beveled edges prevent a complete coverage of the speakers when the device is placed flat on a table. The sound is quite impressive. Although the maximum volume is relatively high, the small speaker does not distort the sound. It renders mids and trebles quite clearly. Although it lacks bass for construction-related reasons, music sounds fairly decent. 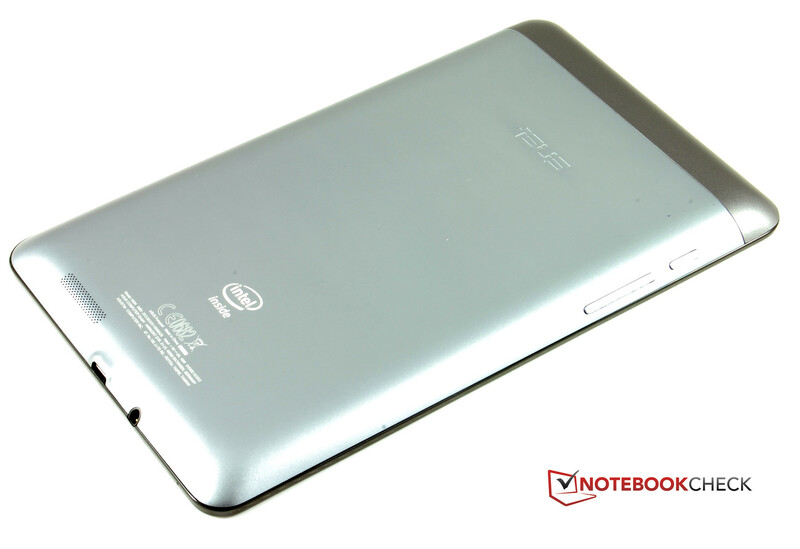 The battery's technical specs indicate that the same battery is installed as found in Asus' entry-level Memo Pad ME172V. It is also a lithium-polymer model with 16 Wh and a capacity of 4270 mAh. The battery did not provide very long battery runtimes in MemoPad. 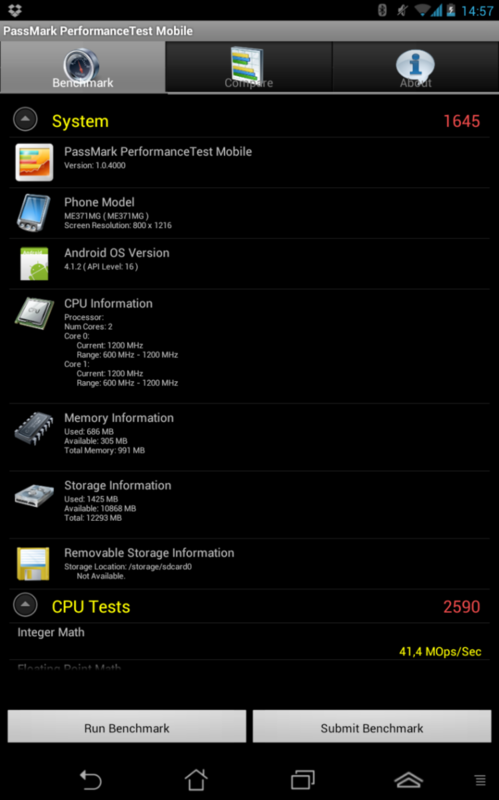 This was due to its relatively high power consumption especially in idle mode. 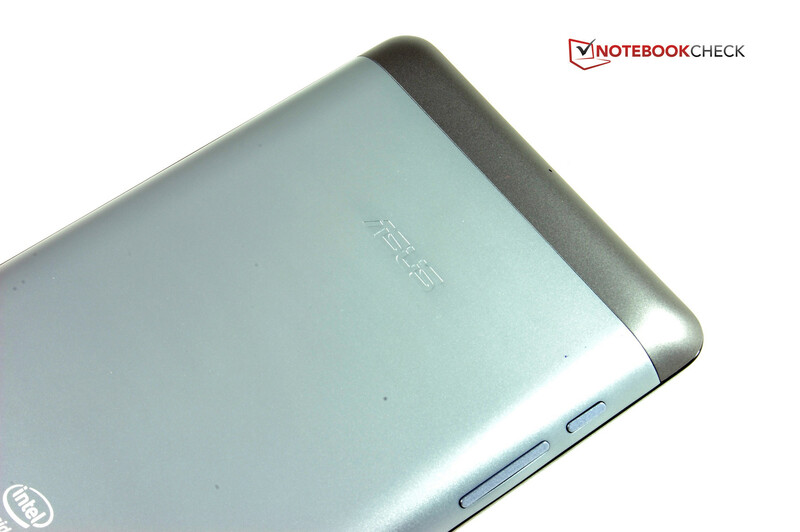 The ascertained results indicate a much higher efficiency of Asus' Fonepad at first glance. However, it seems our gauge was faulty because a maximum of 2 watts is absolutely unrealistic. Therefore, we will omit these test results. The battery runtime is more important. The temperature recordings already proved that the power supply's capacity is too low. The small PSU barely manages to recharge the battery during normal use. The battery drained while playing games or watching videos even when the power supply was connected. The battery capacity of 16 Wh is quite high. It is exactly the same as in Google's Nexus 7. However, the battery runtimes were not always on the same good level. 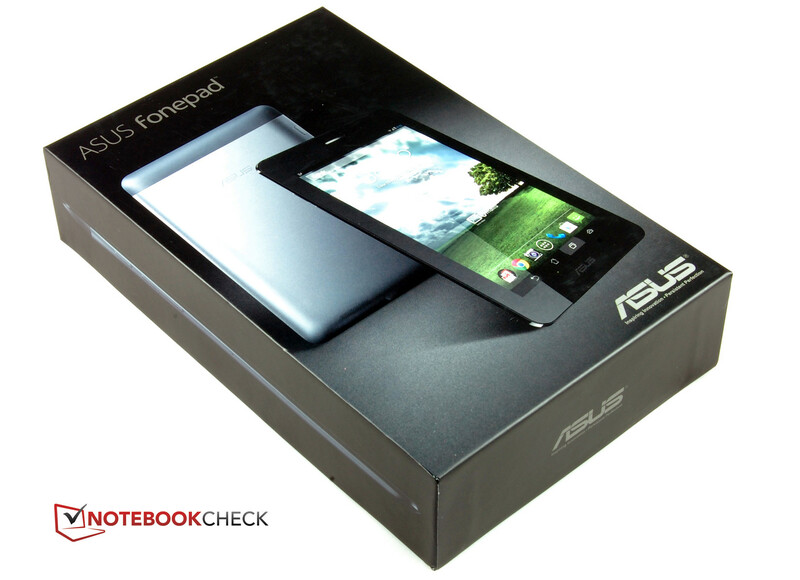 Asus' Fonepad lasts much longer than the contender from the American corporation in single tests. The shortest battery runtime that we ascertained during simulated full load via the Stability Test app and maximum brightness was a very good 4:15 hours. 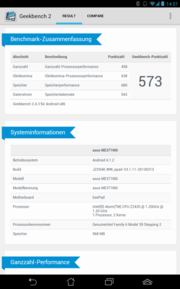 However, the Nexus 7 and Fonepad are almost equal in the Wi-Fi test, performed with 150 cd/m². 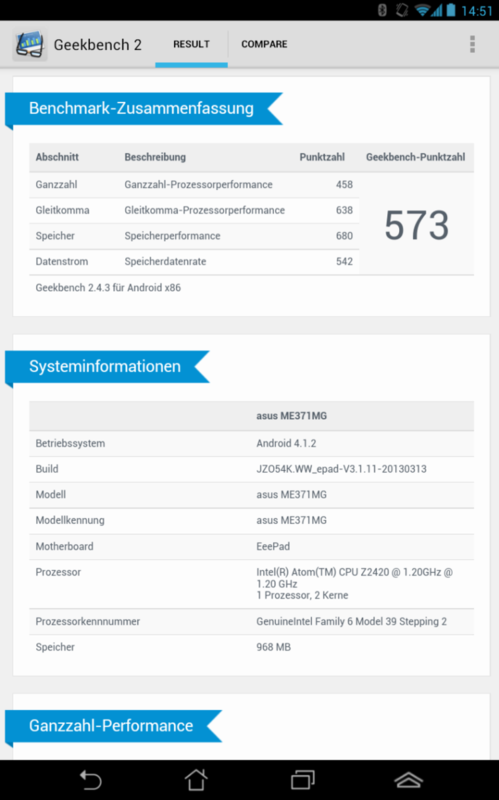 Asus' Fonepad and Google's Nexus 7 good maximum runtimes of 18:54 hours were also very similar, which we ascertained using a read script. We experienced a nasty surprise when it came to the recharging time using the series' power supply. It needed a whole eight hours to completely recharge the Fonepad. 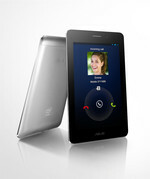 A tablet for calls - Asus again uncovered a new gap. Nevertheless, only few users will hold the 7-inch Fonepad next to their ear. Conversations are quite possible when a headset is used, particularly due to the perfect speech quality. However, we don't really understand why Asus does not include a headset for this specific device. 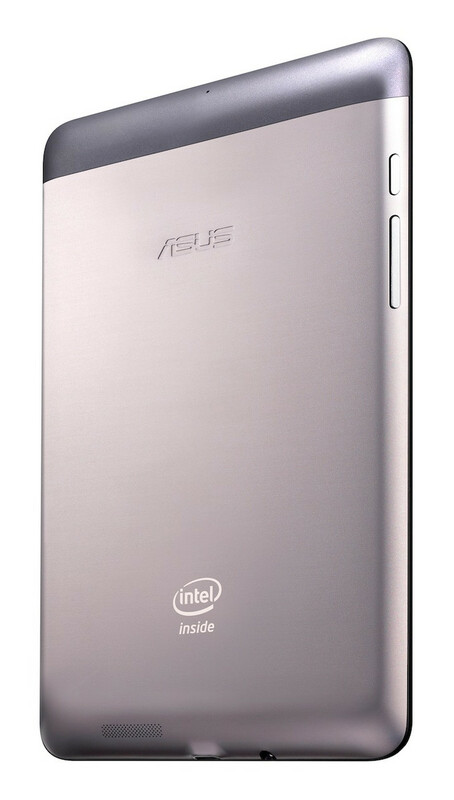 The casing of Asus' Fonepad does not give much reason for complaint. Its build and stability are good and the choice of materials is at least appropriate for this price range. Only the control buttons' awkward accessibility due to the beveled edges did not appeal to us much. The configuration is more than decent for a midrange tablet and also quite unusual with Intel's Atom processor. Like the Fonepad's name already hints, it also features a 3G module as standard. Great focus has been place on the idea of mobility. Asus does not install a rear-facing camera. That is likely also better in view of the front-facing camera's quality. The screen is not completely convincing although it definitely belongs to the better of its kind, particularly in the midrange. The contrast, black value, color accuracy and viewing angles are on a good to very good level. Just the brightness could be a bit higher. We were especially curious about the scores in the performance test seeing that it is the first Android tablet featuring Intel innards. 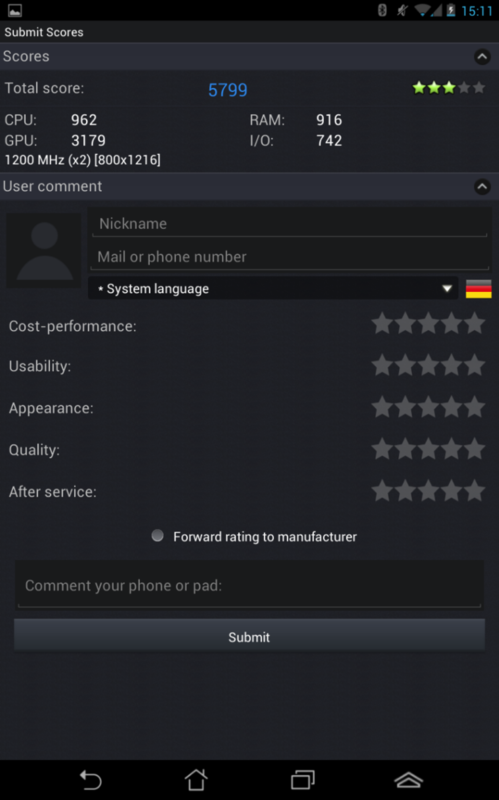 However, the Fonepad could not quite match the Intel smartphones from Motorola and ZTE in the synthetic benchmarks and presented a mixed performance. What's more, Intel's platform still has incompatibility issues with various benchmarks and games. However, the graphics and internet performance were quite good. 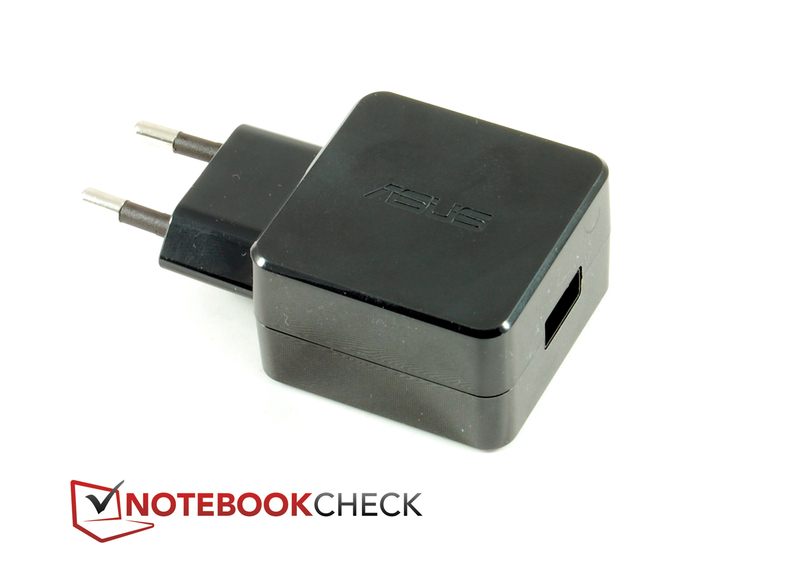 Asus' Fonepad was mostly inconspicuous in the other tests. The battery runtimes are good, though not outstanding. The power supply unit proved to be the only major flaw. However, we cannot completely exclude the possibility that it could be a faulty test model. 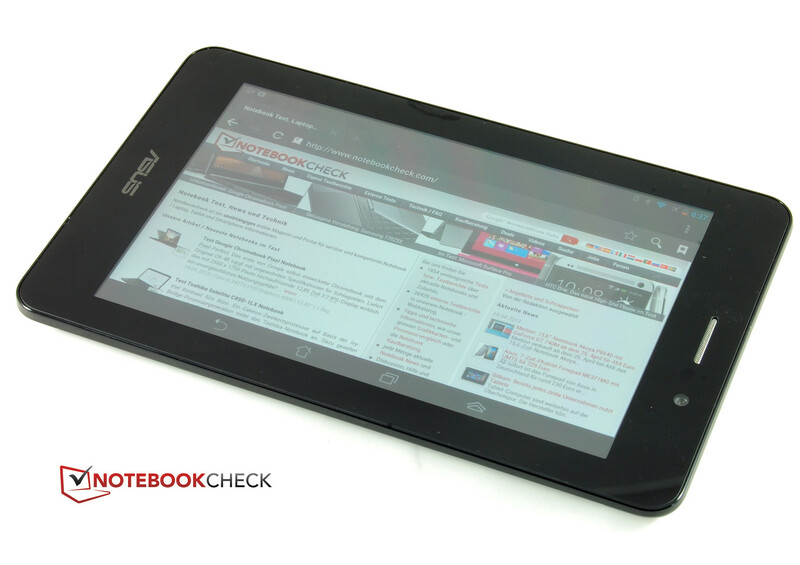 The bottom line is Asus gives an impressive performance with its Fonepad. Users looking for a device for browsing, emails, games and calls and who don't place much emphasis on a compact smartphone can kill two birds with one stone with this tablet for 230 Euros (~$301). The color of our test model is Titanium Gray. This is Champagne Gold. The back's upper part can be removed. USB and headphone jack are on the lower edge. The only camera has a resolution of 1.2 MP. The buttons are hard to use with one hand. A plastic pane protects the screen. The brightness is not outstanding. This is the manufacturer's name. The power supply unit is too weak. 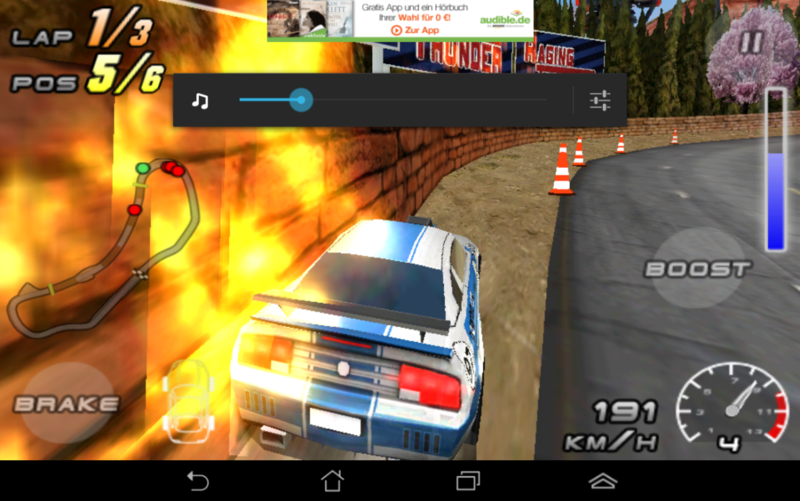 And got very hot in the test. The idea of the Fonepad is not brand new, but interesting. The concept has been well-implemented. A headset and a better camera. 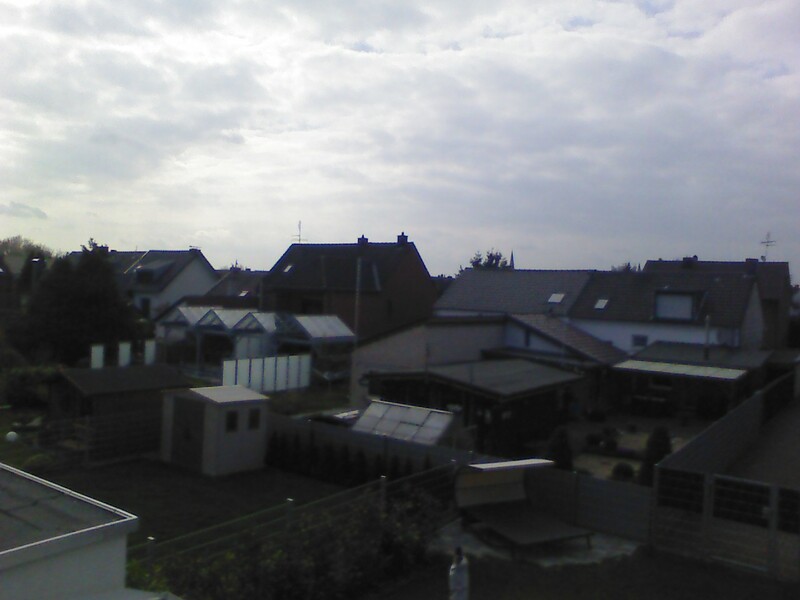 Maybe even a second camera providing the quality is better. That Asus does not include a headset. Even if it sounds like harping on about one point, a headset is a must for this device. Due to its size, the Fonepad competes with 7-inch tablets such as Google's Nexus 7 or Prestigio's MultiPad 7.0 Prime Duo. However, large smartphones like Samsung's Galaxy Note II or Simvalley's SPX-12 might be an alternative.